Free Fab Stuff: Free Samples, Totes, Swag Bags and More! Free Samples, Totes, Swag Bags and More! Knowledge is key to the prevention of cervical cancer. 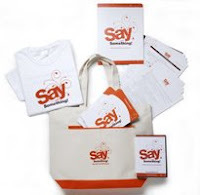 Get a FREE kit to teach a group of women how to prevent cervical cancer. Receive your free samples of Shine to Go for your shoes. Register now to receive a free swag bag from G-Dots.com! Open to residents of US and Canada. FREE T-shirt iron-on download from Dove! Get a FREE TriPro HAT With Your Registration. Get a free sample of Ban antiperspirant-deodorant. To receive a coupon for $1.50 off AVEENO facial care products and a free sample of POSITIVELY AGELESS Lifting & Firming NIGHT CREAM, simply complete the required information fields below and check the boxes selecting your preference. Receive a FREE sample of New Healthful Life from Purina Cat Chow. Get your FREE sample of Purex! Get a FREE Teddy Grahams sample. FREE sample of Viva Paper Towels. Get a FREE sample of Playtex Gentle Glide tampons. Get a free sample of Extra Strength Excedrin.